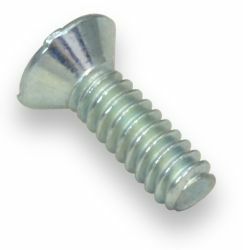 These are general-purpose flat-head screws intended for product assembly. They are RoHS compliant, making them a good choice for products subject to environmental regulations. Note that for flat-head screws, the specified length is the overall length of the screw, from the flat surface of the screw head to the end of the threaded shaft.